A totally simple weeknight dinner recipe for you using the bruschetta recipe from Monday! We bake, roast, and pan fry fish a LOT around here. I buy the bags of frozen fillets and throughout the week, when I “don’t have anything to cook” I can generally reach in, grab three fillets and thaw them out in about 30 minutes to use alongside rice, roasted potatoes, soup, etc. Olive thankfully loves all fish and so it’s a meal that is never stressful for me. What’s even easier is just placing the fillets on some parchment paper (foil also works) with some oil and seasonings, wrap it up and let them bake! I did this last week and it always feels like I went to a lot of trouble, is healthier than my usual pan-fry standard preparation, and the fish is always steamed perfectly. Get creative with the ingredients you put in with the fish – the possibilities are endless! Preheat your oven to 400F. 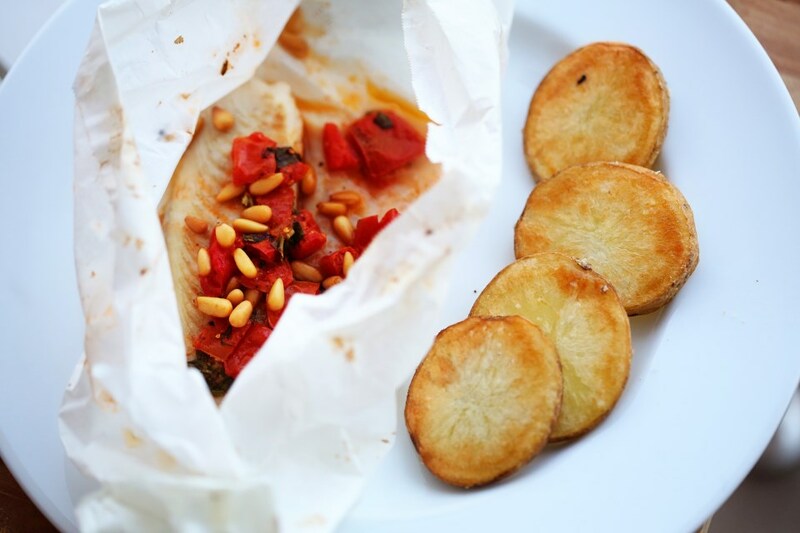 Tear off four squares of parchment paper or foil. Place the butter in the center of each square and place a fish fillet on top of the butter. Season the fillet with salt and pepper. Top with bruschetta and pine nuts and squeeze a lemon over the top of all of it. Fold the sides up and together and crimp to close. Place packages on a rimmed baking sheet and bake together for 20 minutes. You can add just about anything to the fish that you have in your fridge – olive tapenade, green beans, corn relish, fresh herbs and sour cream – honestly, just have fun! 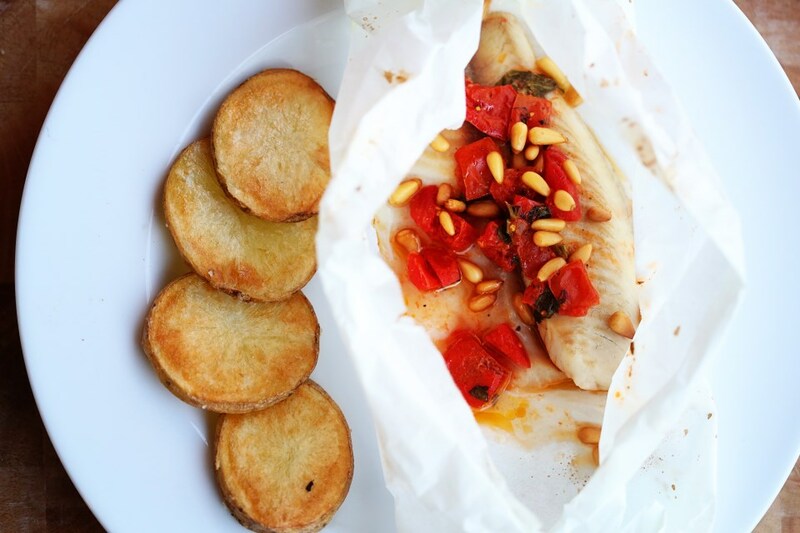 This entry was posted in Cooking Basics, Cooking Tips, Fish, Healthy Meals, Uncategorized, Vegetables and tagged baked fish, easy weeknight meals, fish baked in parchment, fish recipes, healthy meals, parchment fish, steamed fish, weeknight recipes. Bookmark the permalink.